Today’s business relies on the IT department more than ever. The Internet of Everything (IoE) now requires a fully functioning datacenter to avoid business grinding to a halt, products not reaching the market and services disappearing. It is impossible to meet all user, customer or partner expectations without a fully functioning datacenter, which is the driving force for organizations to modernize and optimize their IT resources. An important part of this modernization is standardizing predictable, repeatable and very stable data center reference architectures. The reference architecture defines a technology design and deployment that addresses the specific requirements of a business need. This includes the blueprint and best practices for installation and configuration, which all work together in the most optimal state. The reference architecture defines which specific technologies and products are combined and how address them in a particular use case. The reference architecture is a template solution for enterprise IT. To build an IT infrastructure design based on the reference architecture, you will want to first clearly define the specific expectations and requirements. Next, you will need to provide a detailed overview of the involved components. The enterprise IT department looks for designs that deliver the required performance and the necessary data protection and Availability. A template based on NetApp, Cisco and Veeam, for instance, would be based on several integrated infrastructure offerings. Veeam would work closely with both Cisco and NetApp to jointly design, test and validate an optimized configuration for deploying and powering Veeam Availability Solutions. This process eliminates guesswork in the early system design stages, simplifies ordering and reduces testing cycles before implementation. The converged NetApp and Cisco FlexPod solution provides a standardized way to combine NetApp FAS storage with both Cisco UCS server performance and Cisco Nexus switching. FlexPod configurations are very common for the Tier-1 applications and available for different use cases such as virtualization, VDI or Microsoft Exchange. The recently released Cisco HyperFlex hyper-converged platform offers a unique way to leverage virtualized SAN and compute power across different nodes within one cluster and with unified management. HyperFlex HX220c and HX240c nodes can be built up and extended dynamically and flexibly to meet changing business needs and IT capacity requirements. These hyper-converged solutions are a great fit for virtualization of Tier-2 applications, VDI, ROBOs (Remote Office & Branch Offices) and test/dev environments. With Cisco UCS Appliances for Veeam, which is built on Cisco UCS C240 and C3260 size and capacity configurations, Veeam Availability Suite makes it easy to deliver a full data-protection design for IT environments. In this example, a combination of three technologies – storage, networking and Availability – allow you to design an architecture that fulfills both business and IT requirements. Figure 1 shows how you can build a data center based on this reference architecture. The Cisco Appliance for Veeam is a central management and orchestration point (see Figure 1, #1) for all data protection and monitoring tasks within a reference architecture. It doesn’t matter if you run a Veeam backup, replication or cloud job or if you want to monitor your virtualized environment, the Cisco Backup Appliance combines all you need here. During performance tests in the Veeam lab, this joint solution reached a throughput of 1,100 MBs on a single 3x60 node and reached a limit of 10 GBit/s Ethernet backend. The server node still had more than 60% of CPU and RAM resources available. Based on these tests, we expect to reach a throughput of more than 2.5 GB/s per C 3x60 server, (Figure 2) when fully loaded with the maximum of available CPU cores and a properly configured 40 GBit/s Ethernet and storage backend. For the Tier-1 applications, a Cisco/NetApp FlexPod delivers the required compute, storage and network performance (Figure 1, #2). To backup and replicate data from FlexPod, Veeam uses unique snapshot integration (Figure 3) with NetApp DATA ONTAP to minimize the overhead in VMware and/or on the production storage. During a backup/replication job, Veeam creates a VMware snapshot, followed by a storage snapshot on NetApp. The VMware snapshot is immediately deleted because Veeam will now have a consistent VM state in the NetApp snapshot. 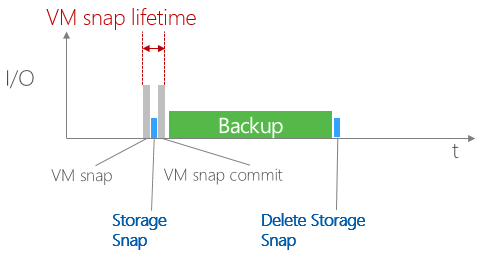 After VMware has committed the snapshot, Veeam either triggers a SnapMirror/SnapVault update to a secondary NetApp (Figure 1, #3) to be used as source, or VMware can start the backup directly from the primary storage. The NetApp snapshot is then mounted to the Cisco Backup Alliance to proceed with the job. After the job is finished, the storage snapshot is automatically deleted. You can also leverage our NetApp integration to orchestrate ONTAP snapshots and control the SnapMirror and SnapVault connections between different ONTAP systems (Figure 1, #4). For Tier-2 applications, such as Test/Dev or for VDI and ROBO deployments, the new Cisco HyperFlex (Figure 1, #5) system provides the required performance and management. The Cisco Backup Appliance for Veeam is used to backup data (see Figure 1, #6, and Figure 4) from the Cisco HyperFlex or replicate (Figure 1, #7) VMs between HyperFlex and FlexPod. This appliance provides a fully flexible way to back up and move data wherever needed. In addition, you can also leverage replicated data with features such as Veeam SureReplica to automatically verify your replicas for recoverability. It does not matter if you are in a technology or waste management industry, business still continues to change quickly and require new levels of IT agility and stability or you will risk disrupting the applications, services and data that power your business. That is why Veeam believes that EVERY business is in the software business, and why a reference architecture that fully address your business, infrastructure and management requirements, is absolutely critical to your Always-On Enterprise.